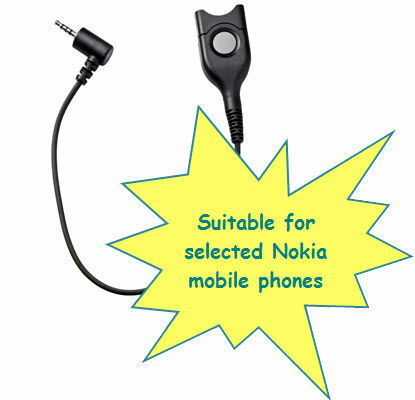 The CNOK02 adaptor cable allows for connection of your Nokia mobile phones to any Sennheiser CCxxx or SHxxx headset. This cable is a smart, high-quality accessory for mobile professionals. Turn your office headset into a mobile headset. The CNOK02 supports the superb voice transmission and noise suppression of Sennheiser telecom headsets. This cable is the right accessory for professionals on the go who do not want to compromise on perfect voice transmission. Connects to any Sennheiser telecom headset with an Easy Disconnect connection.